What makes a great book for kids? I'd say it's a book that makes them want to read more, a book that makes them smile or wonder, a book that makes them think about it after they close the page. It's a book that inspires kids to create their own stories and feel the power of their own words. 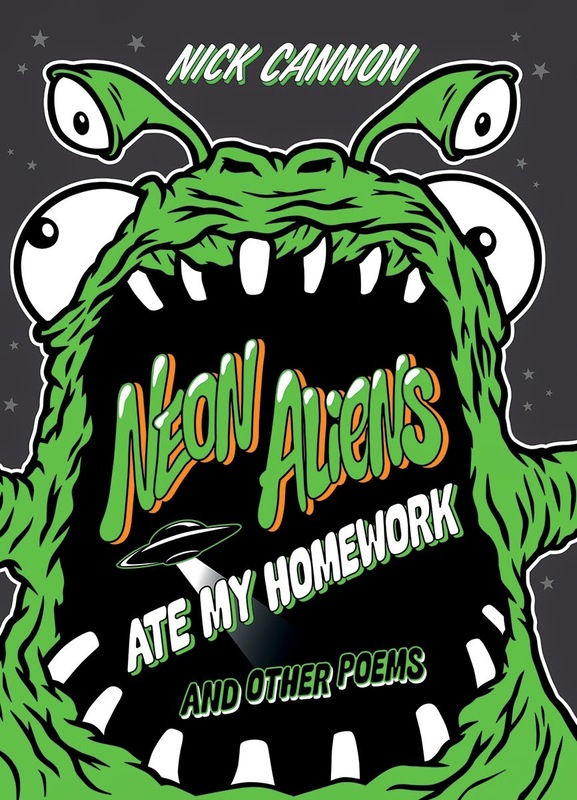 Neon Aliens Ate My Homework is a collection of poems from comedian, musician and actor Nick Cannon that did just that. Cannon shares a collection of poems that range from giggle-inducing to gross, thought-provoking to full of bravado, and this variety was very appealing to my students. They loved how one minute they were laughing about neon aliens eating up Nick's backpack to the next minute thinking about how they can believe in themselves and stand up to bullies who spread hatred. Throughout, Cannon shows kids the power of words -- the words they read, and the words they write or say themselves. 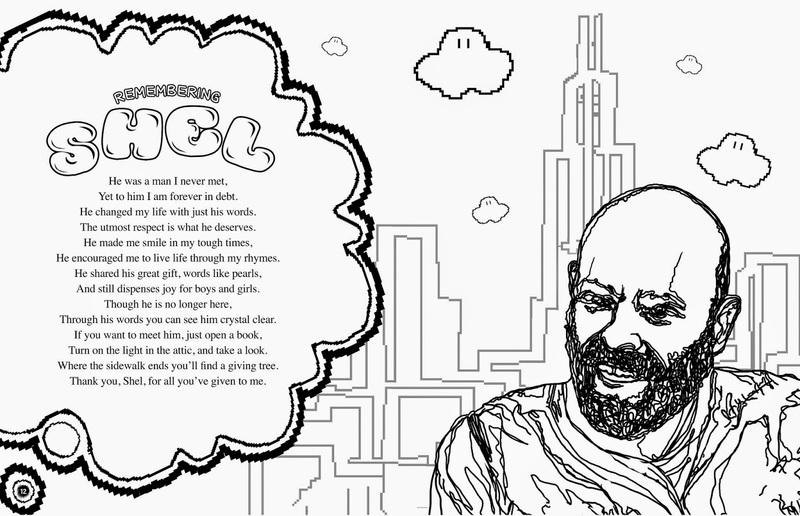 He starts by honoring Shel Silverstein, still a favorite among my students. This lets us talk about the power of books, both their staying power (their kids might read these same books!) but also the escape that they can provide during difficult times. "He changed my life with just his words. The utmost respect is what he deserves. He encouraged me to live life through my rhymes." 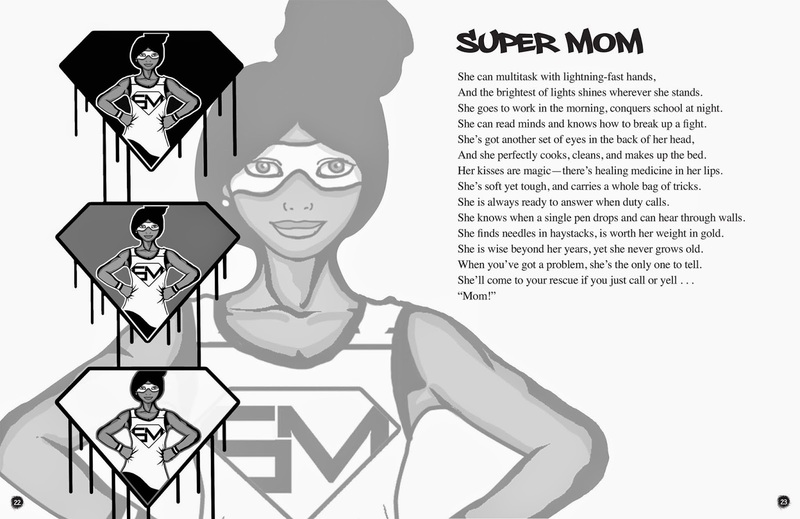 We were able to dig into some of his imagery and characterization, whether Cannon used it to inspire us ("SuperMom" below) or entertain us ("Pink Lunch Lady"). His poems resonated with my students. They understand how a mom can be "soft yet tough" and could see how his examples helped show this. And the brightest of lights shines wherever she stands. She goes to work in the morning, conquers school at night. She can read minds and knows how to break up a fight." Today, my students especially responded to the poem "Haters." We talked about Cannon's message and the power of his words. We talked about what the imagery meant, how hate can melt away. These are all skills that the Common Core is asking students to do -- but here, we are taking a modern poem that speaks to their experience to show how meaningful it can be. 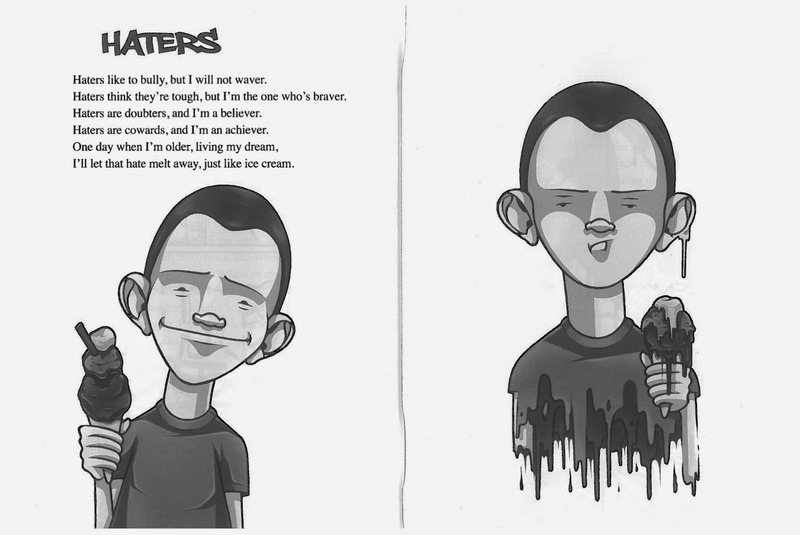 'Haters like to bully, but I will not waver. Haters think they're tough, but I'm the one who's braver. Haters are doubters, and I'm a believer. Haters are cowards, and I'm an achiever. I'll let that hate melt away, just like ice cream." Seek out this book and the audio recording. You can hear Nick Cannon reading his poems, which conveys how heartfelt so many of these poems are. My experience is that 2nd and 3rd graders respond best to this collection, hitting the same sweet spot as Shel Silverstein. 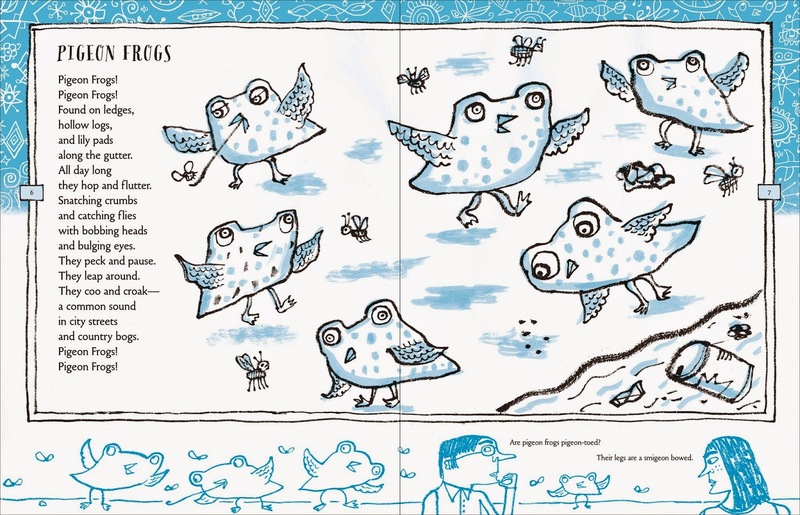 Illustrations ©2015 by Nick Cannon, Art Mobb, and Morf; used with permission from Scholastic. The review copy was kindly sent by the publisher, Scholastic. The audiobook review copy was borrowed from our local library as a downloadable audio through Hoopla. If you make a purchase using the Amazon links on this site, a small portion goes to Great Kid Books. Thank you for your support. Every spring, I love hearing birds chirping outside as we wake in the morning--a sure sign that daylight is coming earlier each day. 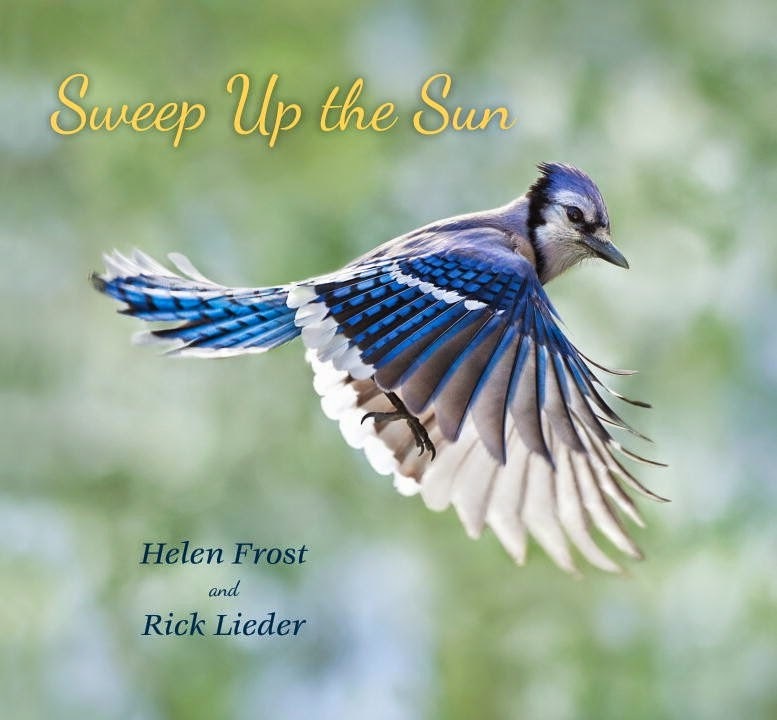 As we enjoy our last week of National Poetry Month, I would like to share two new books that celebrate the beauty of birds in nature, prompting us to marvel at birds in nature. ride the wind and explore." We can read this as a direct encouragement for children to take off and soar on their own. Lieder's amazing photography captures birds in mid-flight, freezing a moment in time. The final two pages provide brief information about each of the species photographed, ranging from house sparrows to Northern Cardinals. Pair these two books together and talk with children about the power of art and the call of nature. Why did these artists decide to focus on birds? What drew them to capture their flight? What do they want their audiences to think about? How do the poets words capture the birds' flight in a different way? The review copies were kindly sent by the publishers, Candlewick Press and Two Lions. If you make a purchase using the Amazon links on this site, a small portion goes to Great Kid Books. Thank you for your support. Our 3rd grade teachers are also focusing on persuasive writing this month, and they are asking kids to identify problems and suggest solutions. The challenge for kids is to explain how their solutions will work and persuade others that it's a good idea. 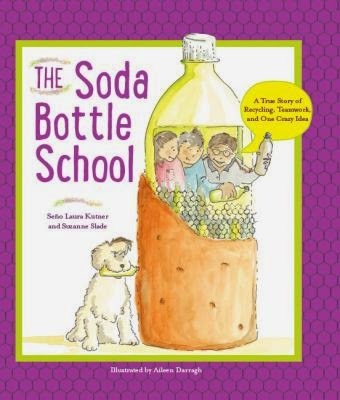 We read The Soda Bottle School as an example of how kids and teachers in one community identified an important problem and led the way with a creative solution -- and the kids loved it. The town of Granados has a problem: they don't have enough room in their school to teach all the kids. But they have another problem, too, that kids can relate to: there is too much trash all around their community. One day, teacher Seño Laura notices that a soda bottle is the same width as the beam of an unfinished school building. She has a crazy idea: what if they used empty soda bottles to create walls for a school? It could take care of two problems at once! The whole community pulled together to support the teachers and children, gathering thousands of empty plastic bottles and stuffing them with trash to create “eco-ladrillos” (bricks). These bricks were stacked between the framing for the building, held in place by chicken wire fencing. A thin layer of concrete was slapped on top as a final layer. Slade and Kutner draw young readers right into the story, helping them relate to the protagonist, young Fernando. My students especially liked the photographs and authors note included at the end of the story. I just found this news clip that would be another great way to share this story. My students were interested and inspired to think of problems they would want to solve around our school. I especially liked this example because Kutner and Slade emphasize the importance of teamwork and thinking outside the box. The review copy came from our school library collection. If you make a purchase using the Amazon links on this site, a small portion goes to Great Kid Books. Thank you for your support. Students and teachers around the US are writing persuasive essays with renewed interest, as the Common Core explicitly calls on students to write opinion pieces that support a point of view with reasons and information. See, for example, the ELA Writing Standard 5.1. 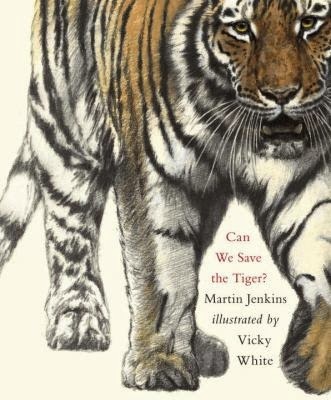 At the Emerson Library, we have been reading Can We Save the Tiger?, by Martin Jenkins, to see how he develops his argument and supports it with reasons and information. 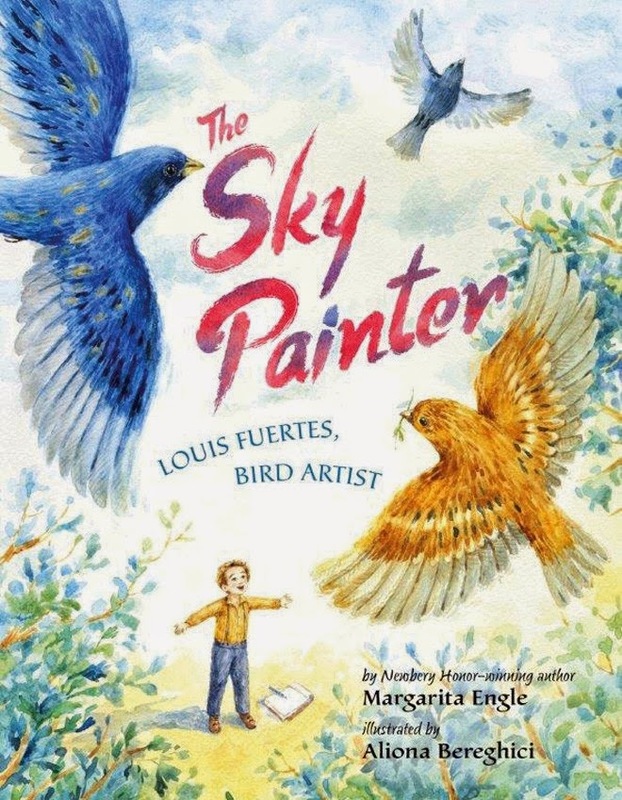 Read my full review of this terrific nonfiction picture book. Today, I want to take you into our concluding library lesson, where we examined Jenkins' text to see how we could learn from his writing. We read the concluding two pages, projected on the screen. For each page, I asked students what key phrases they noticed that were particularly powerful. You'll see their responses in green below. Students noticed that Jenkins began his conclusion with, "So you see, trying to save just one endangered species..." Their teacher drew this back to a phrase they had used in class: "As you can see..." Other students noticed the way he wrapped up his conclusion (see below) with a question to pull readers in: "And I think that would be a shame, don't you?" We wanted a little more specifics about helping tigers, so we turned to online research. The World Wildlife Fund has several very helpful pages about problems tigers are facing and action we need to take. This makes terrific model writing. Here's just one of the sections we looked at and the students' responses. 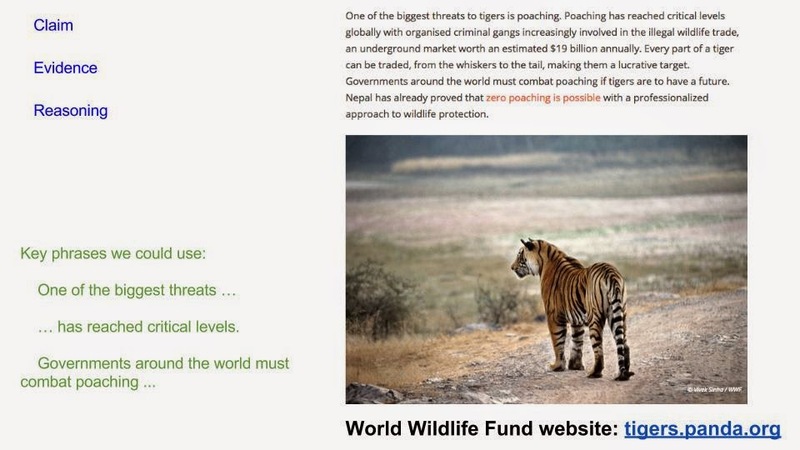 "One of the biggest threats..."
"Poaching has reached critical levels..."
"Governments around the world must combat poaching..."
We talked about how they can use similar language in their own writing, regardless of the topic. School librarians play an essential role in helping students develop their persuasive writing skills. We help identify mentor texts, for students to read on high-interest topics. Much of my work in this area has been influenced by Melissa Stewart's writing on mentor texts. I definitely recommend reading her wealth of posts about this topic. School librarians also help students dig deeper into topics they care about, guiding them on authentic research. So much information is available on the Internet, but it is critical that we help students effectively find information they can read and understand. 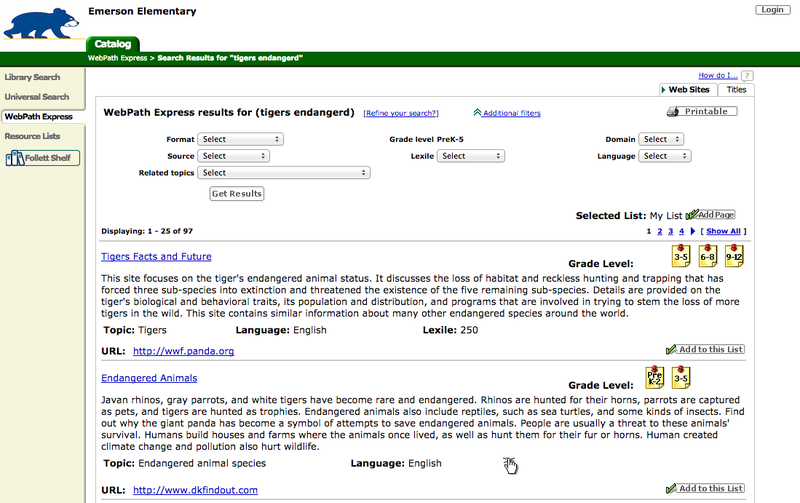 I used our library catalog's Destiny Web Path Express to target the WWF article. 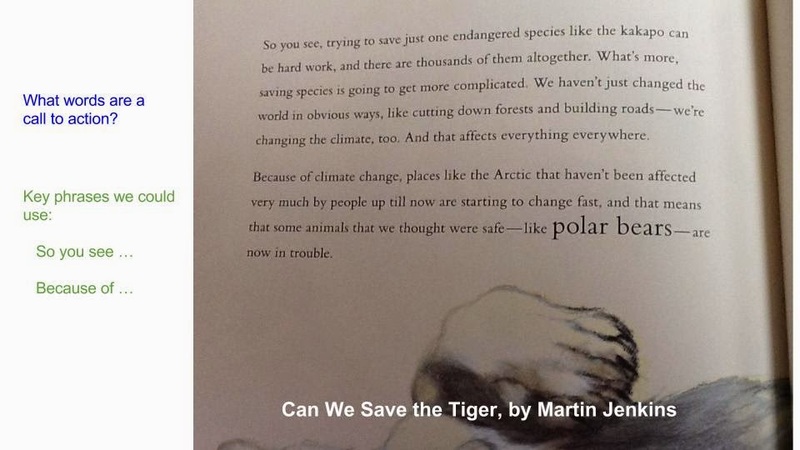 This post is part of my larger body of work: Common Core IRL: In Real Libraries. My thinking and work in this area is greatly helped by conversations with fellow bloggers and friends, Alyson Beecher, Cathy Potter and Louise Capizzo. See our full presentation from last summer here. Novels in verse have particular power speaking to kids. Some really like the way that there are fewer words on the page. It can make reading them feel less overwhelming. Others like how much they can "read between the lines", letting their imaginations fill in the gaps. Others love the way these poets play with language. Today, I'd like to share my personal top ten favorites (in alphabetical order). I adore sharing these with students. But know that there are many others that my kids love. At the end, I'll share two books on my "to be read" (TBR) pile. 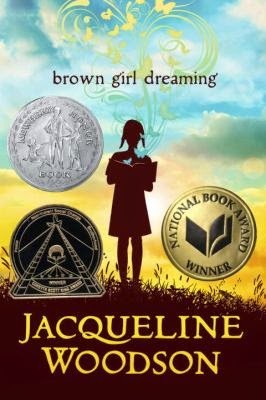 I have loved talking with my students about this book, how they can relate to Jackie's experiences, how they can see themselves in the book, how they can feel some of her own journey even if their experiences are different. 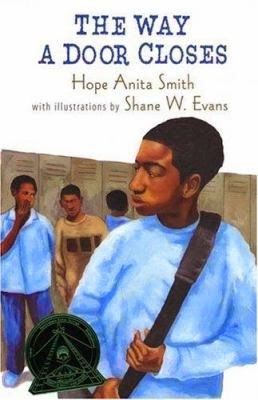 Winner of the 2015 Coretta Scott King Award, the 2014 National Book Award, and the 2015 Newbery Honor. You can read this incredible novel as a basketball story, as a family drama, or as a novel written with a modern ear using rhythms and rhymes infused with music and motion. It speaks to kids in all sorts of different ways. 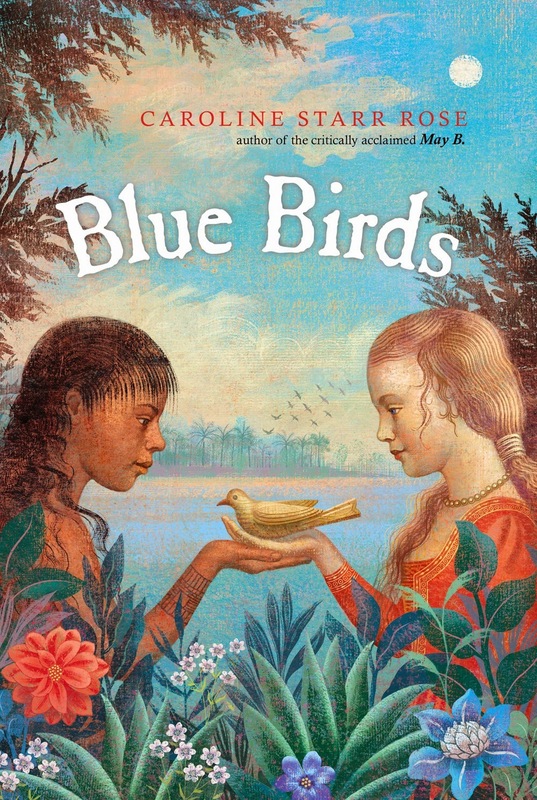 Winner of the 2015 Newbery Award, and the 2015 Coretta Scott King Honor. In flowing free verse, Annie describes her love of running, the changes in her best friend Max, the birth of her baby brother and her grandfather's growing confusion and dementia. Annie's world feels as if it's unraveling with all this change. As she runs for the pure pleasure of running, thoughts and questions race through her mind. Oh, how I love this book. We start with Jack, who's dreading writing his own poems, forced to keep a poetry journal for his teacher. But as we get to know Jack and as he gets to know different poems, we start to see a fuller picture of a boy, his dog and his feelings. Check out this terrific reader's theater through TeachingBooks, starring Sharon Creech, Walter Dead Myers, Avi and Sarah Weeks. 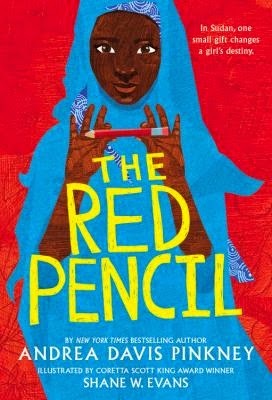 I was fascinated when I asked Andrea Davis Pinkney about why she chose to write this story in verse. She explained how she wanted to tell a story for elementary students about the Sudanese conflict, and she felt that a novel in verse would allow them more space. She was able to keep some of the more difficult scenes quite spare, so that students could infer the tragedies rather than be faced with the brutalities that her character experienced. My students continue recommending this to each other, talking about what a powerful story it is. Kids are attracted to Kevin's attitude and sass, but it's his journey that stays with them. Kevin is bullied by his older brother at home, but he then turns to bullying classmates at school. By taking pages torn from library books, he makes funny but oh-so-cruel found poems and tapes them up at school. When another student discovers Kevin's journal, he turns the tables and Kevin must find a way to make peace with his victim-turned-aggressor. 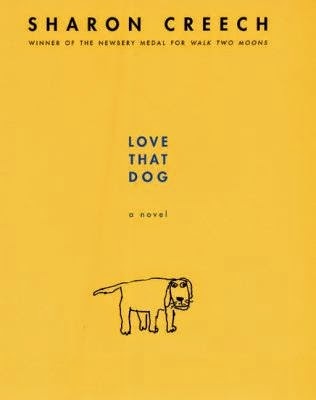 This is a great choice for 5th and 6th graders who might have liked Love That Dog when they were younger. Our students were immediately drawn to Serafina and could connect with her situation, even though it was so different from their own. 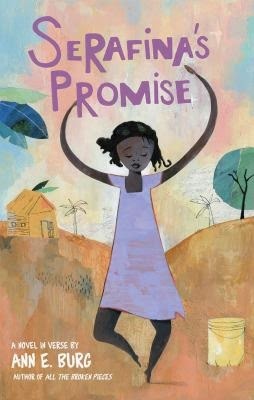 Serafina dreams of becoming a doctor, but she knows that she must go to school to reach her dream. This is no easy feat in modern rural Haiti. How can she do this when her mother needs her help at home, especially with a new baby on the way? Ann E. Burg writes in free verse poetry, conveying Serafina's struggles in sparse, effective language. This slim book reads almost like a short play in three acts. In the first 12 poems, CJ describes how he feels warm and content as part of his close-knit family. But then, everything changes as his father loses his job and then abruptly leaves home. In the 13th poem, when his dad leaves, CJ describes how it felt: "The door closed with a / click. / I felt all the air leave the room / and we were vacuum-sealed inside. / - I can tell a lot by / the way a door closes." This is a powerful book that takes readers on CJ's roller-coaster emotional journey. As a friend of mine wrote, this is a "peek into the mind of a daydreamer" and a wonderful teacher who encourages her in just the right way. Her teacher recognizes that Gabby is coping with her parents separation, and that daydreams are a way she escapes. He helps channel her imagination, encouraging her to let her daydreams come to life in her writing. This is a wonderful, uplifting story of a young girl finding her own voice, staying true to herself. I loved the inventive poetry, the rhythm and rhyme, the creative fantasy. 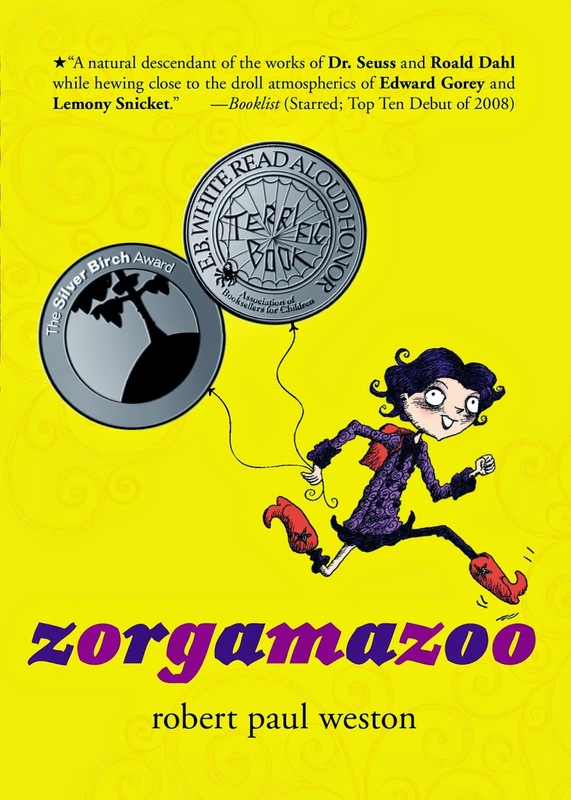 Best way to it: Dr. Seuss meets Lemony Snicket, with a healthy dose of Roald Dahl throughout. The story is fantasy, macabre, silly, and truly great fun to read aloud. The illustrations and book design add a tremendous amount to the story. Absolutely terrific wordplay, combined with a plot that keeps kids racing along with it. 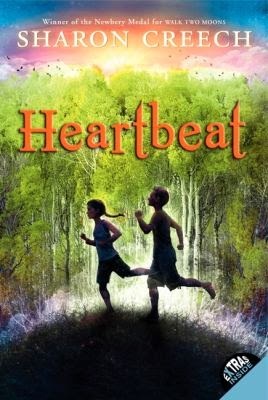 Historical fiction, showing the friendship between a Native American girl and an English girl who's traveled with her parents in 1587 to Virginia. 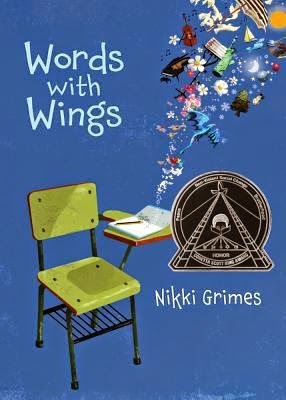 From the publisher's description: "Amid the strife, Alis meets and befriends Kimi, a Roanoke girl about her age. Though the two don’t even speak the same language, these girls form a special bond as close as sisters, willing to risk everything for the other. Finally, Alis must make an impossible choice when her family resolves to leave the island and bloodshed behind." 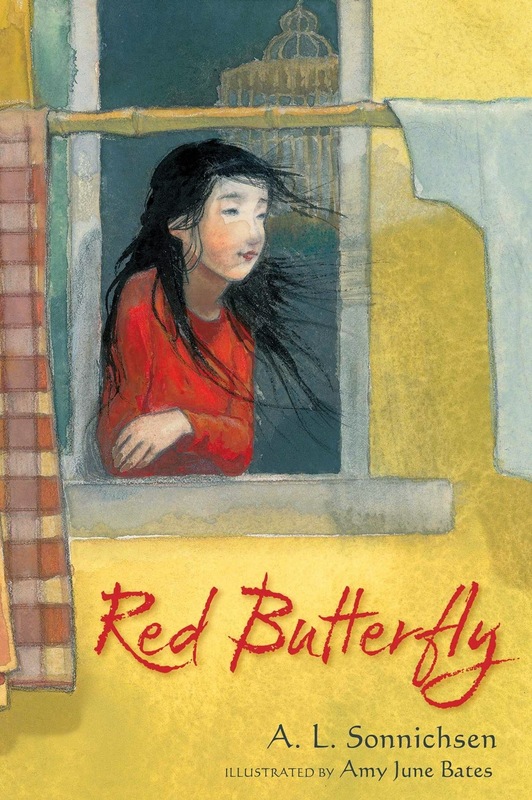 Friends are including this in their favorites of 2015: a beautiful story, beautifully told. From the publisher description: "Kara never met her birth mother. Abandoned as an infant, she was taken in by an elderly American woman living in China. Now eleven, Kara spends most of her time in their apartment, wondering why she and Mama cannot leave the city of Tianjin and go live with Daddy in Montana. Mama tells Kara to be content with what she has … but what if Kara secretly wants more?" I just love it when a character's thoughts and moods meld with mine in my mind, growing and becoming part of me. Novels in verse - usually written in free form poetry - have a particular way of doing this, where the narrator's voice almost flows into me. Poetry encourages us to see the world through a different lens, slowing down to notice small details. But how do you encourage a child who's feeling absolutely stuck, unable to let go enough to trust their own "poet's eye"? 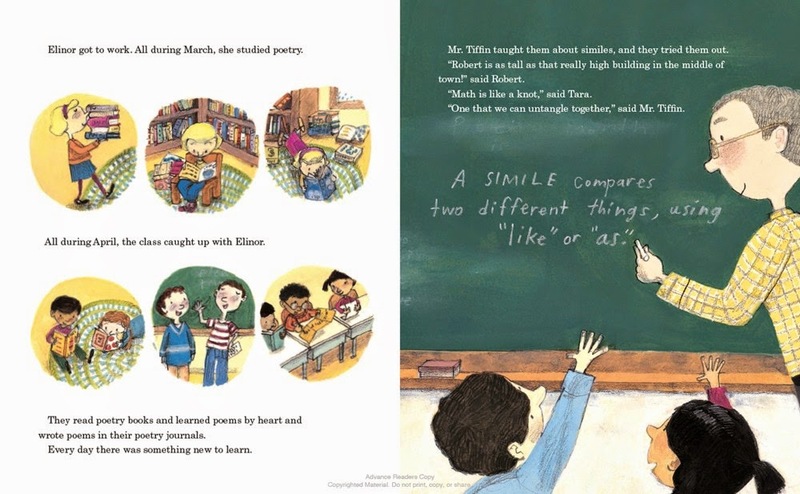 This delightful new picture book offers a gentle lesson on how a special teacher and a visiting poet did just that. 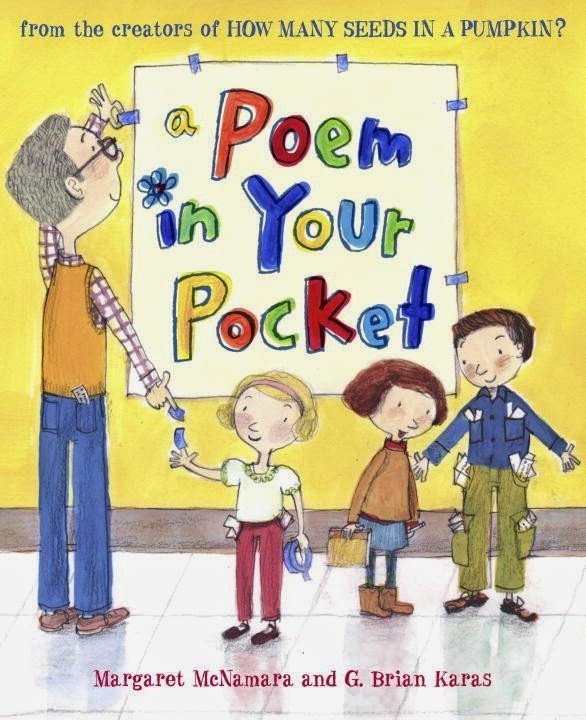 Everyone in Mr. Tiffin's class is excited when he announces that poet Emmy Crane will be visiting in April to celebrate Poem in Your Pocket Day with them. All through April, Elinor and her class start reading poetry, learning about different types of figurative language and forms of poetry, and writing their own poems. "Mr. Tiffin taught them about similes, and they tried them out. 'Robert is as tall as that really high building in the middle of town!' said Robert. 'Math is like a knot,' said Tara. 'One that we can untangle together,' said Mr. Tiffin." When Elinor has trouble writing her own poems, Mr. Tiffin encourages her to keep trying. "Remember, poetry is a messy business," he tells her. But the more she works, the more frustrated she gets. Many children will relate to Elinor's frustration--staring at an empty page can be overwhelming for any of us. Margaret McNamara develops this story in such a gentle way that she encourages all readers to try using their own "poet's eye." When Elinor finally meets Emmy Crane, young Elinor is nearly frozen with fear. But the kind, gentle writer tells her "no poem is perfect... tell me what you were thinking about." I adore this story, for its message that poetry begins in the heart, and for the way it shows how we all need to be kind and not judge our own attempts too harshly. Brian Karas's illustrations add gentle warmth throughout. I especially love the way he shows poet Emmy Crane as an African American woman, incorporating subtle affirmation of the diversity of our classrooms, students and authors. "Every April, on Poem in Your Pocket Day, people throughout the United States celebrate by selecting a poem, carrying it with them, and sharing it with others throughout the day as schools, bookstores, libraries, parks, workplaces, and other venues ring loud with open readings of poems from pockets." Read the starred review at Kirkus; and a terrific review at the blog Randomly Reading. Teachers, definitely check out this teaching guide. Illustrations ©2015 by G. Brian Karas; used with permission from Random House. The review copy was kindly sent by the publisher, Random House. If you make a purchase using the Amazon links on this site, a small portion goes to Great Kid Books. Thank you for your support. I love sharing poems with kids that create a sense of motion and play through the way they twist words, create movement and bounce to their own rhythm. 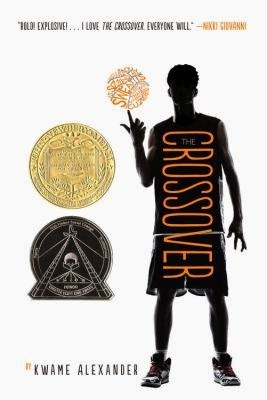 Newbery winning author Kwame Alexander called basketball "poetry in motion", and today I'd like to flip that metaphor around to celebrate two collections that celebrate sports with poetry in motion. 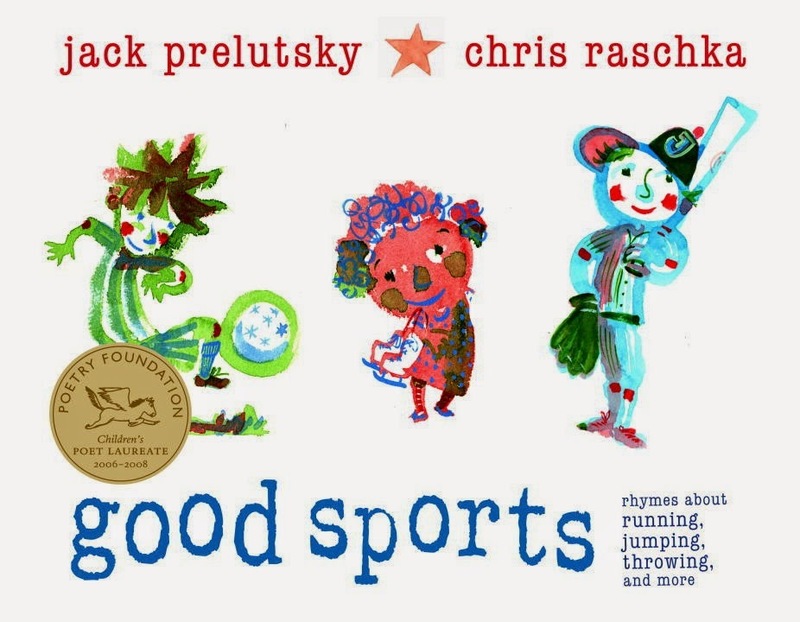 Prelutsky celebrates sports from baseball to soccer to gymnastics, gleefully swinging and catapulting through motion and emotions that will resonate with kids. They'll love his playful rhymes, and they will connect with the way these short untitled poems can get to the heart of how they feel. The ball will go right through the net. For I've been practicing a lot. I know it's good--I know, I know. Then hear the soft, sweet sound of SWISH!" Share these short poems with kids and ask what they notice -- do they like the rhythm and rhyming of the first two lines, or maybe the use of the "s" sounds (alliteration) in the last line, emphasizing the sound of SWISH of the basketball. Rashka's illustrations are loose and impressionistic, especially appealing to 3rd through 5th graders because they don't feel too young. I love how he incorporates diverse kids throughout--the player making the shot above has long wavy red hair, maybe a girl or maybe a boy. 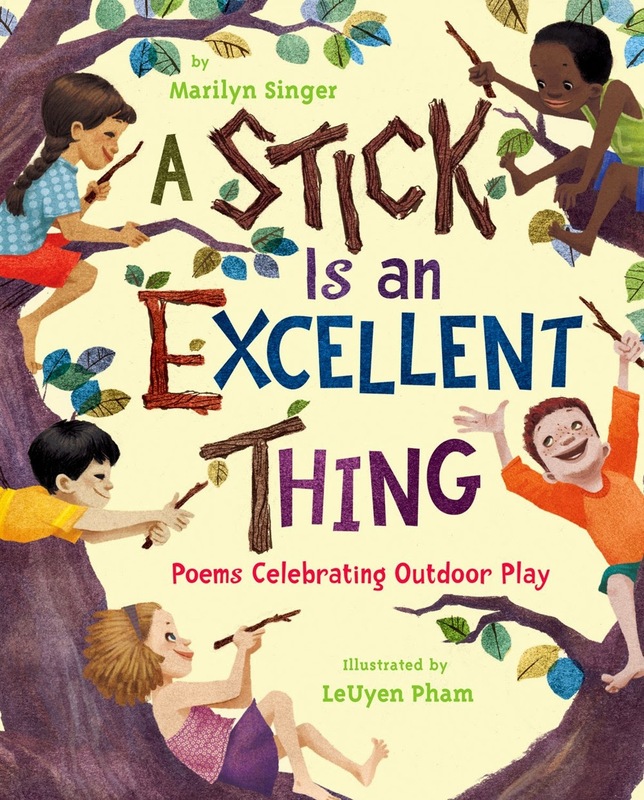 For poems that celebrate all sorts of outdoor playing, definitely look for A Stick Is an Excellent Thing, with Marilyn Singer's playful poetry and LeUyen Pham's joyful illustrations. the curbs, the rims, the little ledges. to stumble, lump or wilt. so that every step is neat. but I never leave the street. Pham's illustrations are full of bouncing, running, smiling kids, in both city and suburban scenes. Kids are playing in large and small groups--I love how she shows how much kids like to play together. Her kids are modern and multicultural, and full of smiles on every page. My older students will relate to Singer's poems, but the illustrations make this collection best suited for younger kids. Both review copies were borrowed as ebooks from the San Francisco Public Library while I was on vacation. Hooray! I especially appreciate the way SFPL has ebook tutorials for first time users. If you make a purchase using the Amazon links on this site, a small portion goes to Great Kid Books. Thank you for your support. I love sharing poetry that makes kids laugh, especially with puns and twists of phrases that make kids giggle. Even better, in my view, is poetry that makes kids think and laugh and then make their own puns. Calef Brown's new collection is full of delightful surprises, perfect for the punster in your life. 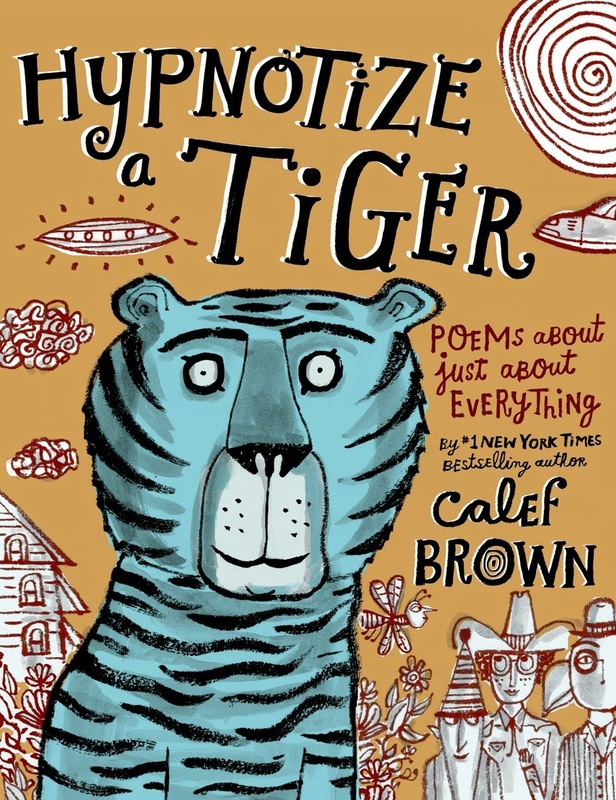 Calef Brown’s witty verse and illustrations leap and frolic from one topic to the next, full of wordplay, humor and rhymes. Whether he's riffing off of his "peeps" like Lazyhead "eating frozen raisin bread" while staring at the TV, or sharing "poems of a particular vehicular nature", Brown is at his best when he combines short witty verse with pen and ink drawings. Irreverent? Certainly! 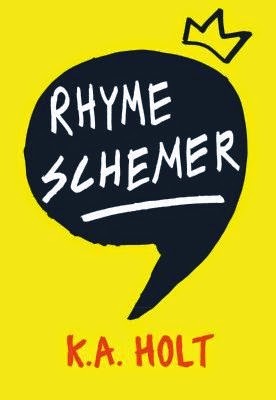 But for kids who think that using a G in the word gnome is completely nuts, this poems makes absolute sense. I also love all the ways that Brown plays with language, not only using obvious end-rhymes like home and gnome, but also substituting beginning sounds to imply rhymes in your head (don't you love gnome-schooled?!). My students and I keep finding treasures to make us laugh. In "Roman Pets", Brown declares that "They even found a dog brush/ in a catacomb." Get it? Cat-a-comb? Dog-brush?!! The footnote reads: "A puppy at play/ on the Appian Way/ was happy to say/ he was not in Pompeii." If you were to combine the qualities of a pigeon and a frog, wouldn't you say you'd find "bobbing heads and bulging eyes"?!! 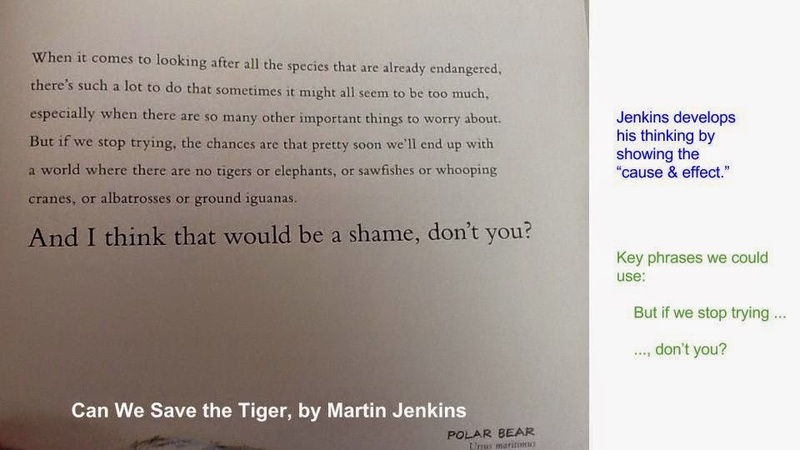 I can't wait to use this poem with our 3rd graders and ask them to work together to make their own creative animals. Illustrations ©2015 by Calef Brown; used with permission from Macmillan. The review copy was kindly sent by the publisher, Macmillan. If you make a purchase using the Amazon links on this site, a small portion goes to Great Kid Books. Thank you for your support. It's fitting that National Poetry Month kicks off each year on April Fool's Day. Modern children's poetry has a strong tradition of delightful mischief and playful humor -- whether it's Dr. Seuss, Shel Silverstein or Jack Prelutsky. Share poetry for the sheer pleasure, but also share it because of its rich language, as it layers so many ideas in short spaces. My students (and teachers!) are going to love this assortment of delicious, mischievous, amusing poems all about food. The topic is immediately appealing and approachable, making it easy to hook kids. Some evoke delicious food or happy memories, like "The Cocoa Cabana" serving hot chocolate at the edge of a skating pond. Others spice it up with humor, like the smoothie surprise with "a whisper of pickle" and "the slime from a snail." 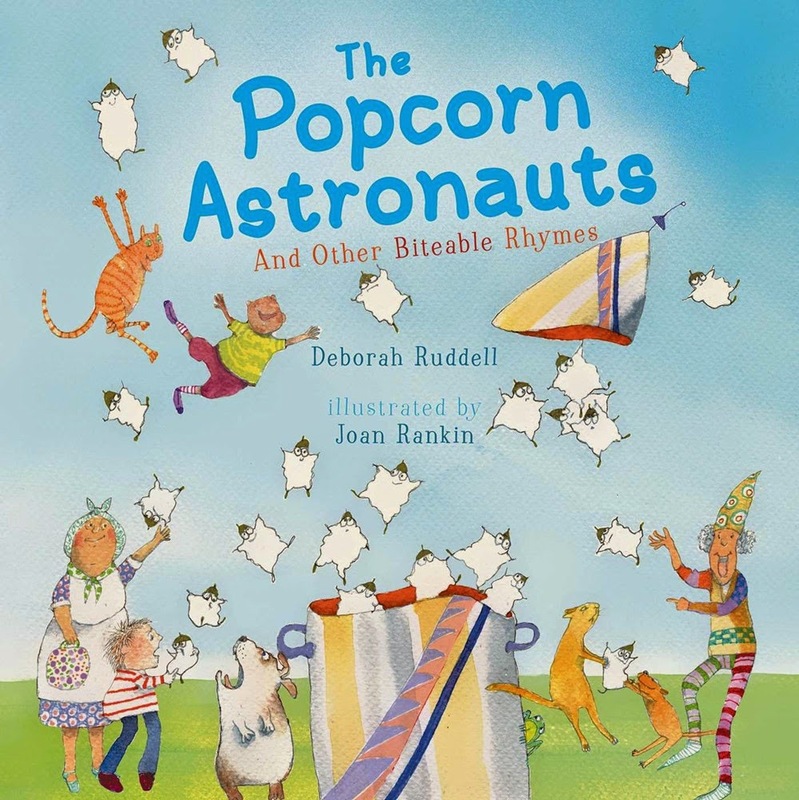 Ruddell mixes it up with different poetic forms, and every poem is rich with imagery that will help young students explore the power of similes and metaphors. Because the topics are so fun, these comparisons will get kids actively involved in creating their own figures of speech. 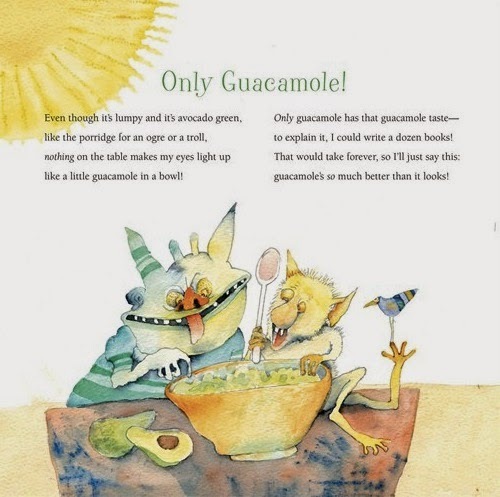 Just thinking about guacamole as porridge for a troll makes me smile! like a little guacamole in a bowl!" The illustrations are equally delightful, helping young readers visualize the poetic imagery and adding their own humor in the process. 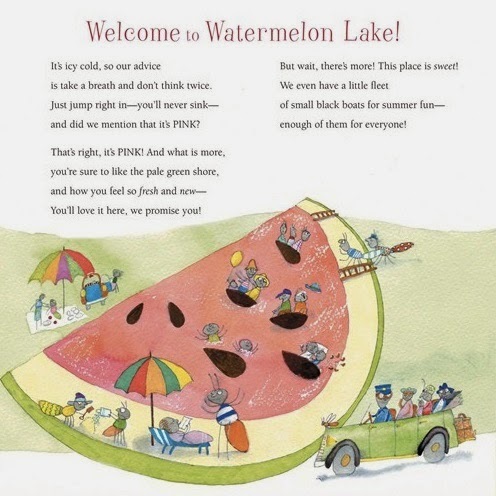 In "Welcome to Watermelon Lake", Ruddell playfully imagines that a slice of watermelon is a giant lake to some little critters. Young children will love Rankin's illustrations that show just how silly this might be. is take a breath and don't think twice. and did we mention that it's PINK?" My all-time favorite poem is "How a Poet Orders a Shake" -- both for the imagery and for the way students could come up with their own "how to" poems. "A frosty cup of moonlight, please,"
as icing on a cake. Do you have a favorite line in this poem? An image that really sticks with you? If you imagine a vanilla shake, what does comparing it to a "frosty cup of moonlight" make you feel like? I'm looking forward to sharing more favorite poetry books for children all month long as we celebrate National Poetry Month. Illustrations ©2015 by Joan Rankin; used with permission from Simon & Schuster. The review copy was kindly sent by the publisher, Simon & Schuster. If you make a purchase using the Amazon links on this site, a small portion goes to Great Kid Books. Thank you for your support.